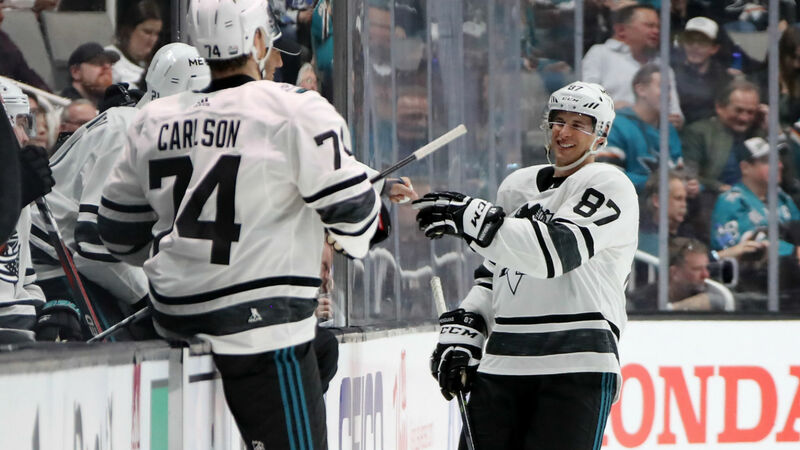 Less than 24 hours after showcasing their individual skills at the NHL’s All-Star skills competition, the stars united and hit the ice for the All-Star Game at the SAP Center in San Jose, Calif. The first game pitted the Central Division, without captain Nathan MacKinnon, who instead served as an assistant coach, against Connor McDavid’s Pacific Division. McDavid’s squad was looking for its third championship in four years but could not hold off Gabriel Landeskog, who netted a hat trick, and the Central in its lopsided 10-4 win. San Jose last held the All-Star game in 1997. In that game, the Sharks’ Owen Nolan famously called his shot and scored against Dominik Hasek to complete a hat trick. 10:56 p.m. — Sidney Crosby is your MVP. 10:54 p.m. — We have a winner! Metropolitan, 10-5, as Henrik Lundqvist cellys. 10:53 p.m. — GOAL. Bad bench management by assistant coach Nathan MacKinnon. Pekka Rinne is pulled but no one goes for him and Cam Atkinson scores the empty-netter. Metropolitan leads 10-5. 10:52 p.m. — GOAL. Central creeping closer as Blake Wheeler scores. Metropolitan leads 9-5. 10:51 p.m. — GOAL. Landeskog to Rantanen to Landeskog to Rantanen and in. Metropolitan leads 9-4. 10:49 p.m. — GOAL With the net empty, Mathew Barzal scores again. Will he be the MVP? Needless to say, Rinne is back into the net. Metropolitan leads 9-3. 10:49 p.m. — With three minutes left, Pekka Rinne is pulled. 10:47 p.m. — GOAL. Off the faceoff, Cam Atkinson skates in and also beats Rinne. Henrik Lundqvist looked very excited on the bench after that one. Metropolitan leads 8-3. 10:46 p.m. — GOAL. Sebastian Aho in all alone and beats Pekka Rinne top shelf. Metropolitan leads 7-3. 10:45 p.m. — GOAL. Braden Holtby makes the save but the rebound bounces right to Ryan O’Reilly, who scores. Metropolitan leads 6-3. 10:44 p.m. — GOAL. The Penguins connect as Kris Letang feeds Sidney Crosby all alone in front for the easy redirect. Metropolitan leads 6-2. 10:43 p.m. — Four choices for MVP: Gabriel Landeskog, Sidney Crosby, Ryan O’Reilly and Mathew Barzal. 10:40 p.m. — GOAL. Roman Josi sets up in Wayne Gretzky’s office and finds Mikko Rantanen crashing the net. Metropolitan leads 5-2. 10:38 p.m. — GOAL. Off a 2-on-1, Gabriel Landeskog shows some patience and beats Braden Holtby stick side. Metropolitan leads 5-1. 10:33 p.m. — After the first period, the Metropolitan leads 5-0. Henrik Lundqvist with the shutout; however, let’s remember how quickly these games can change. Braden Holtby (Metropolitan) and Pekka Rinne (Central) are now in net. 10:32 p.m. — GOAL. With under five seconds left, Sidney Crosby beats Devan Dubnyk. Metropolitan leads 5-0. 10:29 p.m. — GOAL. Seth Jones is putting on a show as he spins on the doorstep. He is denied but Kyle Palmieri scores on the rebound. Metropolitan leads 4-0. 10:25 p.m. — Kris Letang rips one off the crossbar. Referees initially call it a goal but then correctly change their minds. 10:25 p.m. — Just like all the other penalty shots in previous All-Star Games, he does not score. 10:25 p.m. — Seth Jones is pulled down and goes hard into the net. Ladies and gentlemen, we have a penalty shot! 10:19 p.m. — GOAL. Kris Letang fakes the pass and instead buries it past Dubnyk. This game is all Metro so far. Metropolitan leads 3-0. 10:17 p.m. — GOAL. Claude Giroux, who couldn’t buy a goal in the first game, knocks in his own rebound. Metropolitan leads 2-0. 10:16 p.m. — Henrik Lundqvist showing why he’s the king as he robs Mikko Rantanen. 10:15 p.m. — GOAL. Mathew Barzal, Kris Letang and Sidney Crosby is quite a line. Barzal gets the first goal of the game as he rips it over the glove of Dubnyk. Metropolitan leads 1-0. 10:13 p.m. — Devan Dubnyk and Henrik Lundqvist to start in the championship game. One million dollars on the line. Will the Central win its first or will the Metropolitan earn its second title in three years? 9:46 p.m. — We have a winner. The Metropolitan will face the Central for all the marbles. 9:45 p.m. — GOAL. Jimmy Howard pulled and Cam Atkinson blasts the puck for an easy empty-net goal. Metropolitan leads 7-4. 9:43 p.m. — GOAL. Claude Giroux is getting chances but just can’t score; however, he recovers and feeds Sebastian Aho for the easy goal. Metropolitan leads 6-4. 9:41 p.m. — GOAL. Kris Letang with the deke and goes up and over the pad of Jimmy Howard. Metropolitan leads 5-4. 9:39 p.m. — We have our first offside of the night! And Jon Cooper can’t help but laugh. 9:37 p.m. — GOAL. Sidney Crosby heads down the right wing and beats Jimmy Howard with a shot that finds daylight short side. Game tied at 4. 9:33 p.m. — Mathew Barzal not having luck as he gets robbed by Jimmy Howard. He was stoned by Andrei Vasilevskiy at the buzzer in the first period. 9:33 p.m. — Braden Holtby comes up big and stops Auston Matthews on a breakaway and then on the doorstep. 9:31 p.m. — GOAL. John Tavares streaks in all alone and scores with a pretty backhand up and over Holtby. Atlantic leads 4-3. 9:30 p.m. — GOAL. Jeff Skinner with a sweet toe drag atop the crease and then flips it over Holtby. Game tied at 3. 9:30 p.m. — Braden Holtby (Washington) and Jimmy Howard (Detroit) in net now. 9:24 p.m. — GOAL. Seth Jones steals the puck from Nikita Kucherov and rips the puck top shelf over Kucherov’s teammate Vasilevskiy. Metropolitan leads 3-2. 9:17 p.m. — This game definitely has more fancy moves as Claude Giroux tries the ol’ “I’ll turn my back and hide the puck” trick. Andrei Vasilevskiy doesn’t fall for it and makes the pad save. 9:14 p.m. — GOAL. Steven Stamkos, oh my. Stamkos puts his stick between his legs and somehow beats Lundqvist as he’s falling; probably helped that Lundqvist tried a pokecheck. Game tied at 2. 9:13 p.m. — GOAL. Jack Eichel finds his way behind the Metropolitan’s defense and scores. Metropolitan leads 2-1. 9:12 p.m. — GOAL. Seth Jones crashes the net and finishes with the soft hands. Metropolitan leads 2-0. 9:12 p.m. — The game has it’s first post as Claude Giroux rattles one off the pipe. 9:10 p.m. — GOAL. Fifteen seconds in and it’s Sidney Crosby beating Andrei Vasilevskiy stick side. Metropolitan leads 1-0. 9:08 p.m. — Starting netminders are Tampa Bay’s Andrei Vasilevskiy and New York’s Henrik Lundqvist. Lundqvist is the oldest participant at the ripe old age of 36. 9:07 p.m. — Jon Cooper basically not coaching in this one. Had the players sign a board to determine line combinations. 9:06 p.m. — Sidney Crosby, who didn’t participate in the skills competition, is ready to go for the All-Star Game — and gets loudly booed along with Kris Letang. Friendly reminder, the Penguins beat the Sharks in the 2016 Stanley Cup Final. 9:04 p.m. — Once again John Tavares gets booed. 9:03 p.m. — Time for players to be introduced. The band is not as loud this time as Auston Matthews gets a nice cheer. 8:50 p.m. — Dubnyk with some big saves too that aren’t entirely needed as the Central wins easily 10-4. 8:48 p.m. — Marc-Andre Fleury coming up big to keep this a, um, six-goal game. 8:46 p.m. — GOAL. Here comes the Sharks Pacific as Brent Burns scores 10 seconds later. Central leads 10-4. 8:46 p.m. — GOAL. Off a fantastic toe save by Marc-Andre Fleury, the San Jose Sharks go to work and it’s Erik Karlsson with the easy goal. Central leads 10-3. 8:44 p.m. — GOAL. Finally! Johnny Gaudreau gets the Pacific a goal with his proud papa looking on from the bench. Central leads 10-2. 8:41 p.m. — GOAL. Gabriel Landeskog with the one-handed tuck behind Fleury for the hat trick. Is there a mercy rule? Looks like the Pacific will not be defending their title this year. Central leads 10-1. 8:40 p.m. — WOW. I mean, WOW. Big-time glove save by Devan Dubnyk on Connor McDavid. 8:38 p.m. — GOAL. Marc-Andre Fleury charges Ryan O’Reilly and flat out misses. Easy goal for the St. Louis Blue. Central leads 9-1. 8:38 p.m. — Then Joe Pavelski, all alone, is stoned by Dubnyk’s glove. 8:37 p.m. — Joe Pavelski rattles one off the pipe as Dubnyk does a windmill. 8:37 p.m. — These fans are rough as they also cheer when Fleury makes a save. 8:36 p.m. — GOAL. Gabe Landeskog going against the grain welcomes Fleury to the game as he picks the corner. Central leads 8-1. 8:35 p.m. — Goalie switch as Marc-Andre Fleury (Pacific) and Devan Dubnyk (Central) are now in net. 8:31 p.m. — As time is about to expire Elias Pettersson shows off his stickhandling but runs out of room and can’t stuff the puck in. 8:31 p.m. — Awkward. Fans cheer John Gibson when he makes a save. 8:30 p.m. — Johnny Gaudreau robbed by the glove of Pekka Rinne and Doc Emrick calls him by his proper name, Johnny Hockey. 8:29 p.m. — GOAL. Patrick Kane again as he takes the Blake Wheeler pass on a 2-on-1. Central leads 7-1. 8:28 p.m. — GOAL. Wow, what a top-shelf shot by Mikko Rantanen. Probably doesn’t help the fans that John Gibson is a goaltender for the Sharks’ rival. Central leads 6-1. 8:26 p.m. — GOAL. Pekka Rinne takes a Drew Doughty shot off the helmet and then Mark Scheifele heads the other way and beats Gibson. The crowd, obviously heavily favoring the Pacific, boos loudly. Central leads 5-1. 8:26 p.m. — Clayton Keller beats Pekka Rinne but his shot goes off the pipe. 8:24 p.m. — GOAL. And it’s Kane again, this time with the goal as he goes five-hole. Kane early favorite for MVP? Central leads 4-1. 8:23 p.m. — GOAL. Patrick Kane with the pass through the wickets of Brent Burns and right on the tape for Roman Josi. Central leads 3-1. 8:20 p.m. — GOAL. And the home crowd goes wild. Erik Karlsson on a breakaway puts the Pacific on the board as he beats Rinne through the five-hole. Central leads 2-1. 8:19 p.m. — John Gibson robs Patrick Kane and the Pacific go the other way 2-on-1 but Leon Draisaitl lifts one off the pipe. 8:17 p.m. — Good start for the Central which is down a player as Nathan MacKinnon could not go; he’s helping to coach instead. On the Pacific bench, Johnny Gaudreau’s dad Guy is helping out Bill Peters. 8:16 p.m. — Gabe Landeskog finishes off the Ryan O’Reilly feed. 2-0 Avalanche. 2-0 Central. 8:15 p.m. — GOAL Mikko Rantanen gives the Central a 1-0 lead as Ryan O’Reilly forces a turnover against Connor McDavid. 1-0 Central. 8:14 p.m. — In net for the Pacific is Anaheim’s John Gibson and Nashville’s Pekka Rinne gets the start for the Central. Pacific starts with an all-Sharks line of Joe Pavelski, Brent Burns and Erik Karlsson. 8:08 p.m. — Lauren Jauregui with a strong rendition of the US national anthem. 8:07 p.m. — Chad Brownlee singing the Canadian national anthem in a Vancouver Canucks jersey. Brownlee hails from British Columbia. 8:06 p.m. — And can hear the cheers for the Sharks players. 8:05 p.m. — The band is playing super loud but you can clearly make out the boos for Drew Doughty. 8:02 p.m. — It’s showtime! 7:27 p.m. — Warmups are going on. Will the Pacific win their third title? 6:50 p.m. — The players arrived in style. 6:43 p.m. — Let’s be honest, these jersey’s are lit.